About halfway through August and it feels as though summer is about to start winding down! Around here back-to-school is the name of the game. From colleges to elementary schools, next week is the big week for many. 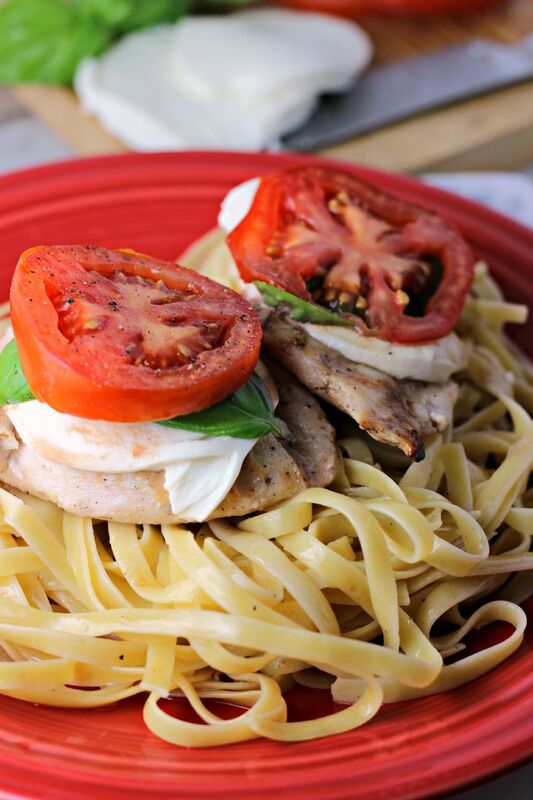 With such a busy time of year arriving, quick and easy dinner are a MUST! 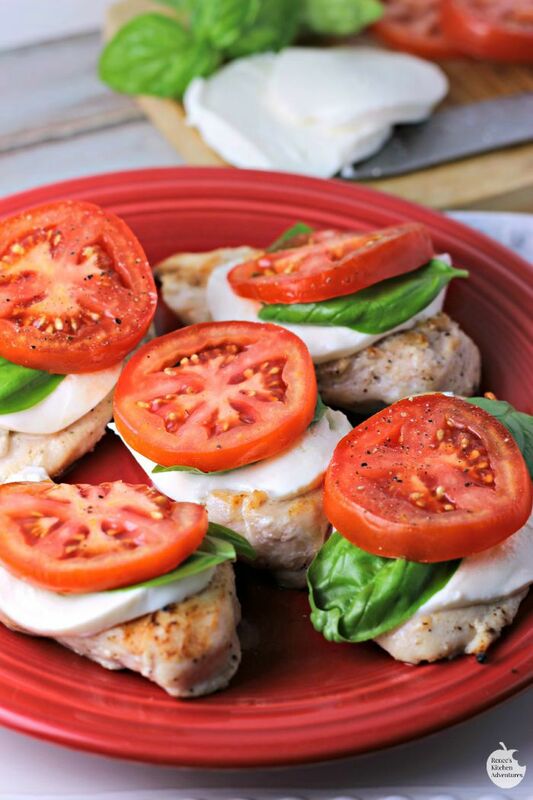 This delicious Easy Grilled Caprese Chicken fits the bill for quick and easy, but also uses some of that wonderful summer harvest you might have! 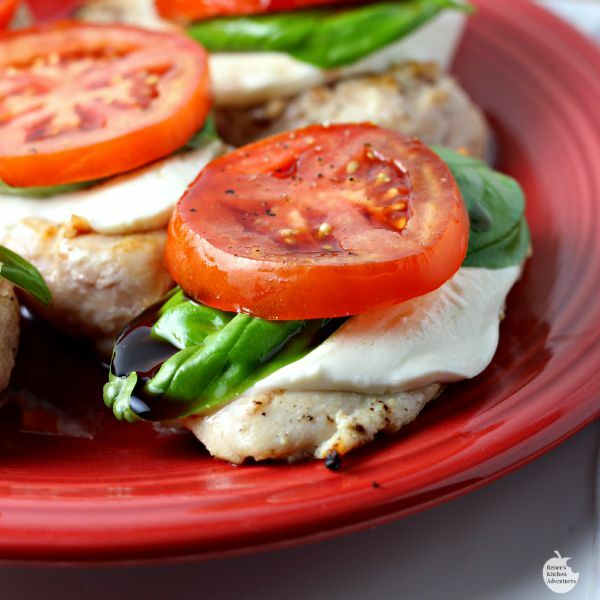 Marinated grilled chicken breasts, fresh mozzarella, fresh basil and garden fresh tomatoes make this dish something special! I always get a little sad this time of year. I was never one of those mom's that wished school began in July to get my kids out of my hair. I actually really enjoyed spending unrestricted time with my kids each summer and the start of school was always a little bittersweet for me. This year is a "life changing" year for me, as I send my youngest child off to college about 120 miles away! Yup, I am about to embark on the next phase of my life known as an "empty nester." Honestly, I'm still not sure how I feel about it and I don't think I am in love with it yet, but I know one thing for sure...I love this chicken dish! haha I love it because it's super easy, super yummy, healthy and perfect for me right now as we pack, pack, pack my son for college! We've been so busy preparing for his move, I've been lucky to get ANY dinner on the table this past week! My husband was happy to come home to this meal last night! I served this chicken with some garlic butter linguine (linguine tossed in some olive oil, butter and sauteed garlic slices then seasoned with salt and pepper) for a delicious weeknight meal! I also drizzled the chicken with some balsamic vinegar before serving, but that is totally optional. I was also happy to use some of my "garden's harvest" for this dish. My red ripe tomatoes from the two tomato plants I potted in the spring and some of my fresh basil! Make sure you store your tomatoes at room temperature for BEST flavor! Whether you are short on time or not, this recipe is a must make and one that you will be serving over and over again! 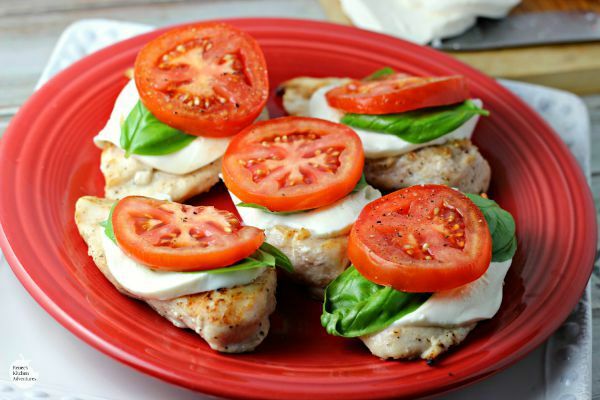 Marinated chicken breasts grilled to perfection and topped with fresh mozzarella, fresh basil and fresh seasoned tomato slices. Combine the chicken breasts and Italian dressing in a gallon sized plastic bag. Make sure chicken is coated with dressing. Close bag and refrigerate for 2 hours up to overnight (overnight for best flavor) turning bag occasionally to disperse dressing. Heat grill to med-high. Remove chicken breasts from marinade, and place on hot grill. Discard leftover marinade. Grill chicken until done (internal temperature of 170 degrees F) turning to brown on both sides. Tent with foil. Allow to sit for 5-10 minutes before serving to let the cheese begin to melt. Serve with linguine, if desired. Prep Time: 02 hrs. 00 mins. I love the ease and simplicity of this healthy dish! Pinned and shared! Yummy! I would love such chicken for dinner! This sounds great! Also, I’d like to see a clickable ‘print’ button.